Present her this diamond bridal ring in 14 karat white gold that is blessed with a touch of majestic beauty. Two luminous baguette diamonds, approximately .06 carat TW, and six sparkling round diamonds, approximately .06 carat TW, adorn this stunning bridal ring. Choose the sparkling center diamond of your choice. Total diamond weight is approximately .12 carat. My fiance and I actually picked this ring out AFTER I had originally shown him an entirely different Shane Co engagement ring... I grew up thinking I would have a family heirloom as my engagement ring. Unfortunately, that didn't pan out. So instead of fretting and trying to recreate something that would never be, I suggested just a simple band would be nice... THEN I SAW THIS! It's the perfect combo of vintage and modern, looking even more impressive in person. It's dainty yet still makes a statement. 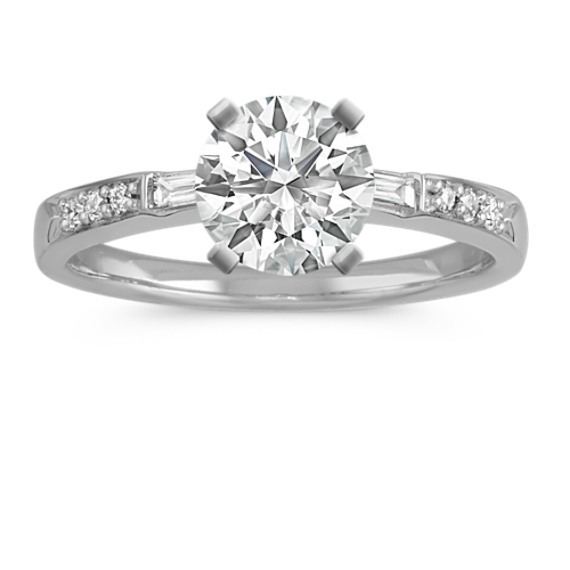 The round diamonds lay in a channel setting that even has a nice elegant looking tapered design as it goes down. While the baguette stones lay in more like a pave setting that adds that beautiful modern look and feel. All leading the eye up to your stone of choice! (In my ring: an .88 cushion cut cognac sapphire). Oh, and it was resized from a size 7 to a 4.5. without any problems. Literally any angle you look at this ring it is impressive and gorgeous! It's not the family ring I admittedly loved, but this band and stone combo made me feel like I got my own personal version of that ring. And that's so much better than what I originally was expecting or hoped for.